GunCruzer Quick Draw 3 Pack Handgun Case. If you have a passion for going to the range and like a lot of people who shoot, you find that taking three guns with you is the perfect number – then the Shooting Range Quick Draw Handgun Case – 3 Pack is your perfect match. Rest assure that your guns will be safe and sound. Simply pull the trigger latches, pop open the lid, and quickly draw your favorite gun. Protective gear can be stored in the accessory compartment. 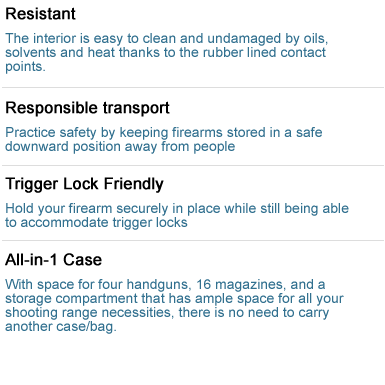 After practicing gun safety, load your gun – the case stores up to 18 magazines. It's time to get started. Ready,..set,..fire! And when it's time to get back on the road, take pride in knowing your case has some of the best features: watertight, corrosion proof, and unconditional lifetime warranty. You're in good company with the lockable 3 Pack Handgun Case - because 3's a charm. 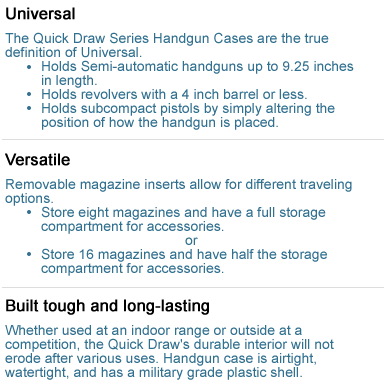 Fits US Military Handguns including M1911A1, SIG M17 and Beretta M9 without accessories. PRESS RELEASE - READ MORE. 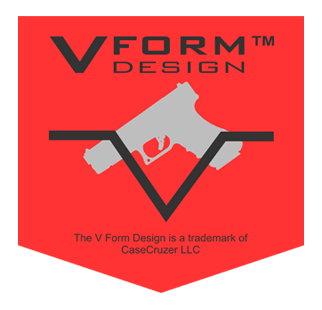 The original CaseCruzer Quick Draw handgun cases can be easily identified by its unique, trademarked V Form Design. Have the perfect gun case custom fitted to your guns. Secure three handguns and three rifles inside the 3N3 GunPOD. Shooting Range Handgun Case holds 4 handguns with space for storing magazines and accessories. Handgun Case is the ultimate solution for transporting six handguns. Available with or without wheels.